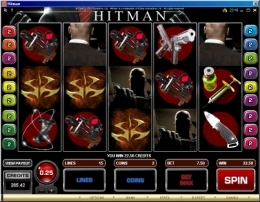 Based on the popular PlayStation game, Microgaming's Hitman slot game combines all the features found in the latest casino slot games including multiple bonus rounds, expanding wild symbols and a massive top prize of 270,000 coins! There are 3 different bonus rounds that can be awarded in Hitman. The Insignia Bonus, the Contract Bonus and the Free Spins Bonus. When 3 Insignia symbols stop on reels 1, 2 and 3 you select 1 of the symbols to reveal your prize. The top prize in the Insignia bonus round is 6000 coins. In hitman the Contract bonus round is triggered when 3 laptop computers stop on reels, 3, 4 and 5. You select a single target from a group of five. Each target represents a range of coin prizes. After choosing a target you then choose a weapon to reveal a random multiplier value. The total win is the target prize multipled by the random multiplier value. The Free Spin bonus round awards 18 free spins at twice your coin wager. The free spins are triggered when 3 or more red "18" symbols stops on any of the reels. Both the Insignia and Contract bous rounds can be triggered during the free spins bonus round but the free spins can't be retriggered. Another great feature of the Hitman slot game is the expanding wild symbol. When the expanding wild symbols stop on reels 2, 3 or 4, they expands to complete winning combinations. The expanding wild symbols play an animated scene and when 2 or more stop next to each other a different scene is played. 5 reels, 15 Paylines, wager from 1¢ to $5.00 per payline. Best Features: The prize in the Insignia bonus round is multiplied by the total bet and not the number of coins on the payline. The 18 free spin bonus round can result in some big hits when when combined with the expanding wild symbol.